A tempeh based alternative to the fishy classic. 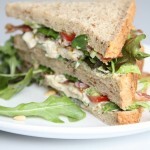 Make a sandwich or add it to greens for a satisfying salad. This recipe is for one serving but it’s so good you’re going to want to multiply the quantities. Keeps for three days in the refrigerator. A tempeh based alternative to the fishy classic. Make a sandwich or add it to greens for a satisfying salad. This recipe is for one serving but it's so good you're going to want to multiply the quantities. Keeps for three days in the refrigerator. Combine all ingredients in bowl, mixing well. Toast two slices of bread, then add two-na salad. Add whatever toppings you would like, then slice in half and serve with your favorite chips. To make into a melt, start with un-toasted bread. Add a slice or two of vegan cheddar and sliced tomato, then grill both sides in an oiled skillet. Once the cheese has melted (or “melted”), remove from pan, slice in half and enjoy! To make into a melt, start with un-toasted bread. Add a slice or two of vegan cheddar and sliced tomato, then grill both sides in an oiled skillet. Once the cheese has melted (or “melted”), remove from pan, slice in half and enjoy!